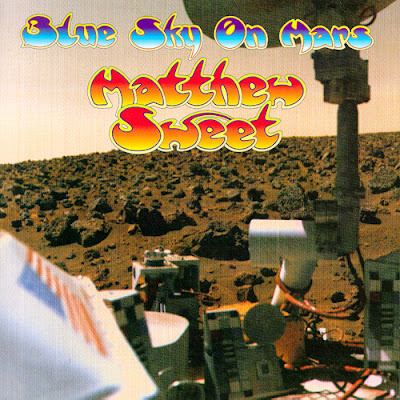 Infinite Art Tournament: Random Record Review 3: Matthew Sweet, "Blue Skies on Mars"
Random Record Review 3: Matthew Sweet, "Blue Skies on Mars"
The Record: Matthew Sweet, Blue Sky on Mars. In 1997, I had completed graduate school and thought it was important to get in touch with The Music That Was Happening Now (ie. Then). Of course, if one is consciously making this kind of decision, the train has by definition already left the station, but I did not realize that yet. I purchased Blue Skies on Mars after hearing two of its songs on a nationally syndicated public radio interview show, because as everyone knows, public radio invariably has its finger on the pulse of cutting-edge music trends. And I still like those two songs ("Behind the Smile" and "Over It"), which are excellent pieces of catchy power pop, although perhaps a bit too similar one to the other to co-exist on the same album with only one song between them. The rest of the record is, to my mind, formula songwriting fleshed out with merely competent arrangement and musicianship. Decision: Discard. This CD is available for the asking, pending ratification of my decision by legal co-owner Mrs.5000. Somehow the Yes font doesn't seem to suggest catchy power pop. Francis Bacon is way cool. I was underwhelmed by "Angle of Repose" if my memory is correct. My lack of memory about it reinforces that notion. It's a map of where they speak French though the northern third of Quebec should probably be lighter blue. This is the most efficient comment ever. Didn't do much for your comment count though. This will help. That reminds me of how much I loved Matthew Sweet's Girlfriend. Sorry, but as your lawyer, a correction is in order. Mrs. 5000 is legally not a presumptive co-owner of this Matthew Sweet CD. Oregon isn't a community property state. Any property that you independently brought into the marraige remains yours exclusively in the absence of an agreement to the contrary. If you look to her to ratify your decision on discarding the CD, you do so without any legal obligation, merely as a courtesy. All this and yet you fail to notice that the title of the CD is clearly Blue SKY on Mars. I think that if that oversight had affected the review materially, my legal team would have caught it.